Lover’s Roost or Lover’s Knoll is the quaint name given in the old days to the little hill between West Gold and Platinum Streets, with a high point east of South Crystal Street. There’s only one house on this entire block. The home at 600 West Gold was built in 1909 for Mrs. Harriet Armstrong, a widow. The property was first staked as a mining claim by William Farlin in 1875. 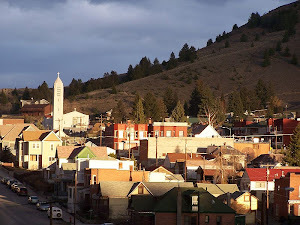 Farlin had established the nearby Asteroid claim, Butte’s first underground silver mine, in 1874. He developed the Asteroid, later known as the Travona, using a $30,000 loan from W.A. Clark’s bank. When Farlin defaulted, Clark took over the Travona, one of his first profitable mines. Mrs. Armstrong, widow of James, bought the undeveloped block about 1908 from the Clark-Montana Realty Company and had the house built from local rock in 1909. There is a great deal of rumor surrounding the home's occupants. It’s been suggested that Mrs. Armstrong built the isolated house away from others because she felt spiteful that Butte’s high society had rejected her because of an alleged 25-year illicit love affair with Alexander Johnston, a cashier with the W.A. Clark & Bro. Bank. He lived in the upscale 900 block of West Broadway in 1900, and at the Silver Bow Club in 1910. Alternative tales included the idea that the woman resident in the house was jilted by a suitor and had gone mad. There is no good evidence for any of these rumors, and while the truth is likewise unknown, it’s probably pretty mundane. Although the home has strong Craftsman-style elements, there is also no evidence that it was designed by Gustav Stickley himself. 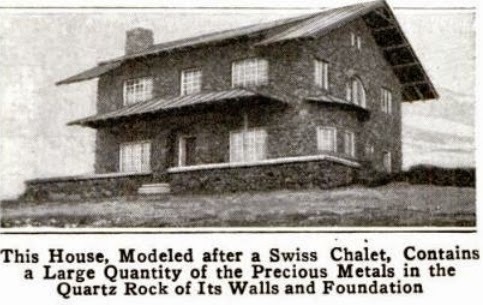 Other rumors suggested it was modeled after the wing of a Swiss chalet. Mrs. Armstrong died of cancer about 1931, and the house was occupied by Alex Johnston from 1934-37. Yes, that Alex Johnston. Real evidence for the rumor? Or circumstantial? Maybe Johnston took advantage of his position with the bank to acquire the house. In any case, it stood vacant for a couple years, until about 1939 when the second long-time owners purchased the home. Dr. Robert G. Kroeze and his wife Cynthia lived here for at least 32 years. Dr. Kroeze’s office after about 1942 was in the Mayer Building (Park Street Liquors, Park and Montana) until his retirement in 1972. The house, its chimneys, and the prominent retaining walls on Platinum and Crystal Streets are all constructed of “porphyry rock,” local granite. The house on Lovers Roost was the first of several to be made from this rock. 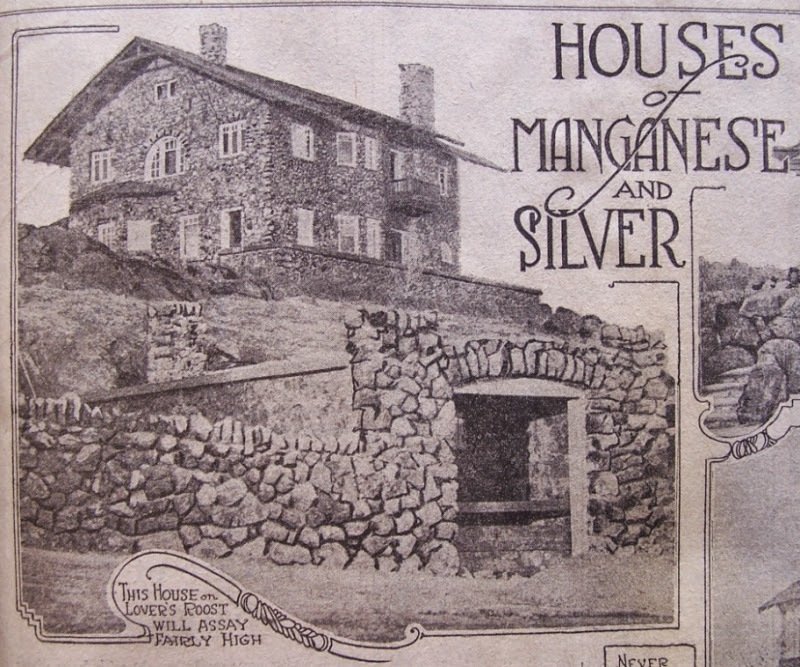 The Standard reported in 1919 that the stones used in the home’s construction were “really the outcroppings of a silver and manganese ledge of unusual length and richness,” assaying from 4 to 60 ounces of silver per ton and 12 to 18% manganese. Some of the rock richest in silver was reportedly from the ledge on the 200-foot level of the Travona. William Farlin was among the few prospectors who stayed in Butte in the late 1860s and early 1870s, when the population dwindled to a few dozen as the easy-to-find gold played out. He eventually took samples to Salt Lake City where they assayed high in silver, and on his return to Butte he staked 13 claims on January 1, 1875, including the Travona (initially named the Asteroid). 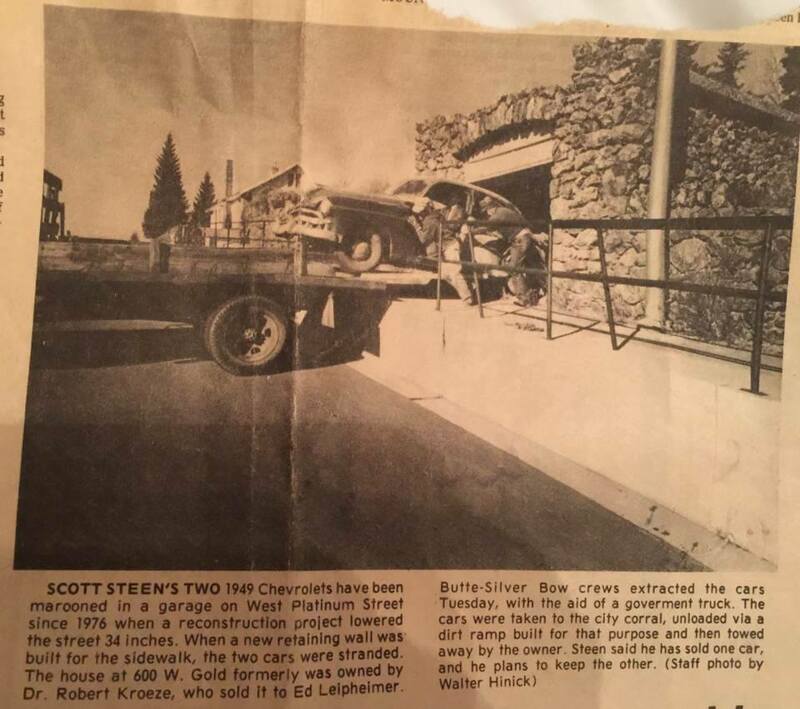 Farlin's discovery proved to be the rejuvenation of Butte – this time, for silver. 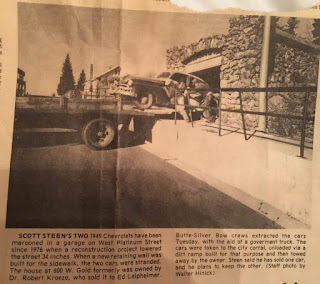 Image above from Stacy Leipheimer, who adds, "Ed and Myrna Leipheimer bought the house in 1979 and that is when they had to move the cars out. Dr. Kroese was spending time at his home in Mexico when he came home and found they had lowered Platinum Street." Resources: Architectural Inventory; Anaconda Standard, Nov. 30, 1919; May 16, 1909; Popular Mechanics, April 1917; Sanborn Maps; City Directories; 1884 Bird’s-Eye View.